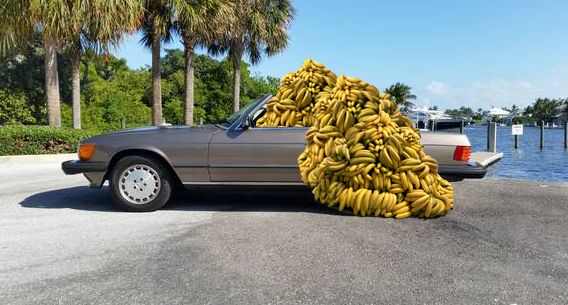 “Eat me” (2016) a large pile of bananas, standing along, or on top of a convertible car from the 1950’s or ‘60’s, almost completely blocking the car from the viewer, a virtual trompe l’oeil that hides the symbols of power, technology and time. The bananas are offered as food for pedestrians, yet the viewer is complicit in knowing that they will eventually, inevitably, ripen and rot. The banana pile trivializes the power of the car, along with the phallus, by preventing its actual use, while mocking the enormous power we give to these masculine symbols of capitalism. The public is invited to interact through the action of eating and becoming immediate participants in the parody of phallocracy through the act of consuming bananas, in an attempt to comment about the flagrant male viewpoint in life.